Clear covers are available in three weights and several sizes to fit your needs. Our covers are made of crystal-clear vinyl to enhance your documents. If you need a size that's not listed here, call us for a quote. We can cut custom sizes to fit nearly any application. 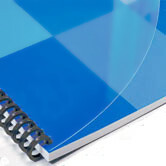 Letter, legal, and tabloid/ledger size clear covers are in stock. Clear covers are sold in packs of 100. Heat-resistant covers should always be used with tape or other thermal binding equipment.